August 14th, 8:30 in the morning. 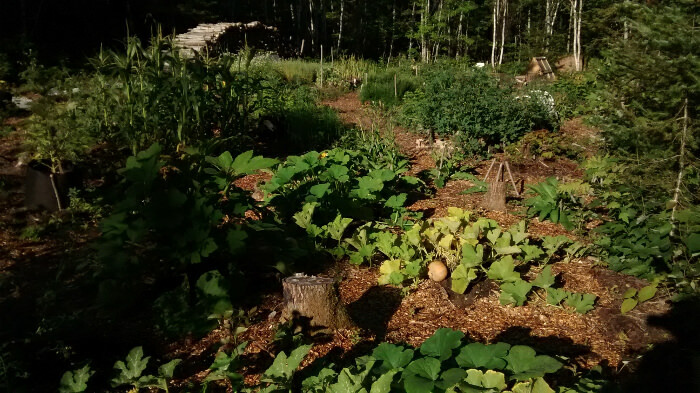 The aspen regrowth is shading squash and corn. Maple stumps are also showing vigorous regrowth. If they grow straight then maybe I won’t need willow for fences. I don’t have many pictures about the willow patch because, well, it doesn’t grow very fast. The slugs gave them a hard time during their spring rampage. The cuttings are not dead there is hope. August means raspberries. 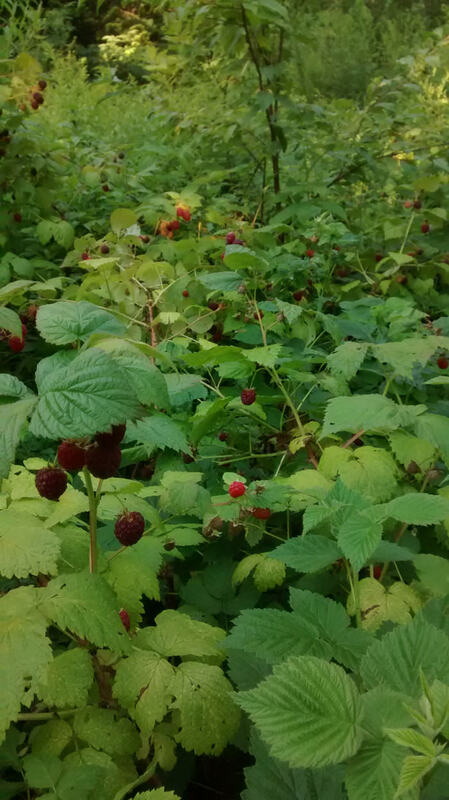 There is a u-pick about 10 minutes from here where we get most of our raspberries. These ones taste so much better. The bushes are going wild on my father’s land and I’m thinking of bringing some over to the gardens next year. 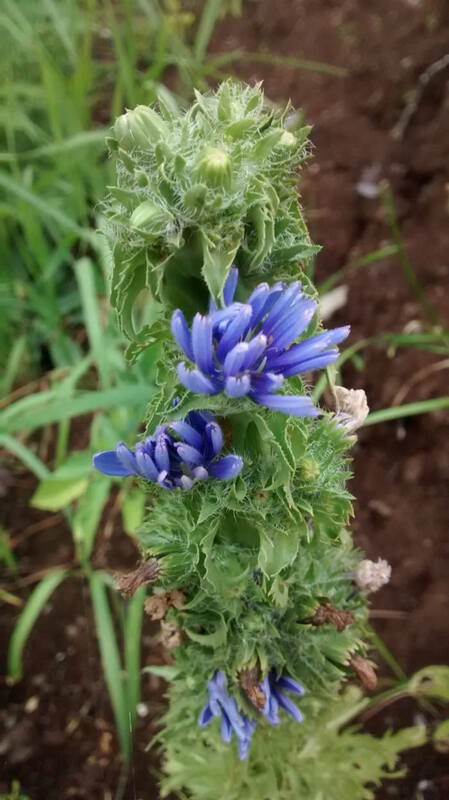 The wild chicory is having a hard time but this chicory is in flower. On the side of the hugel, no less. Not much grows on there. Endives Rhodos, that’s what on the packet. The leaves were too bitter for my taste but I let them be. I can’t believe how much alike red romaine and wild chicory flowers are. I showed this picture around and nobody could guess it was romaine. I would never have guessed myself because you know, romaine is just lettuce with boring leaves. Another surprise. How do the seed companies remove the parachute? Red Romaine is such a beautiful plant. 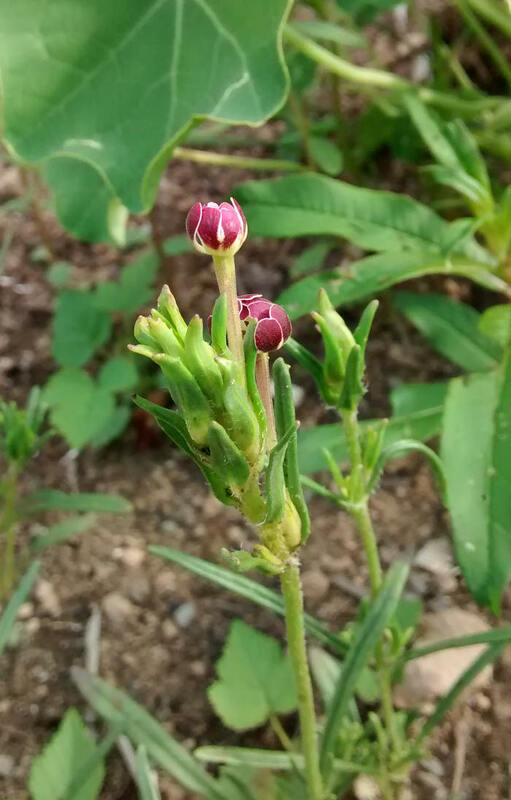 I wonder if the garden is going to be infested by these little jewels next year. 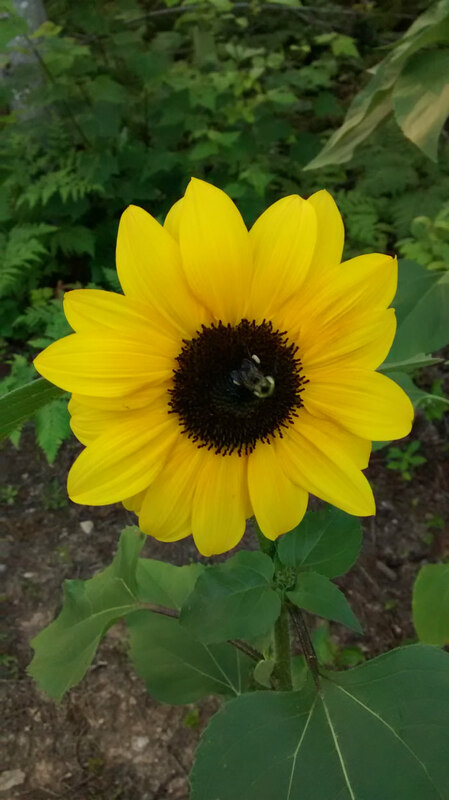 The moonshadow sunflower is supposed to be white. This one is bright yellow. 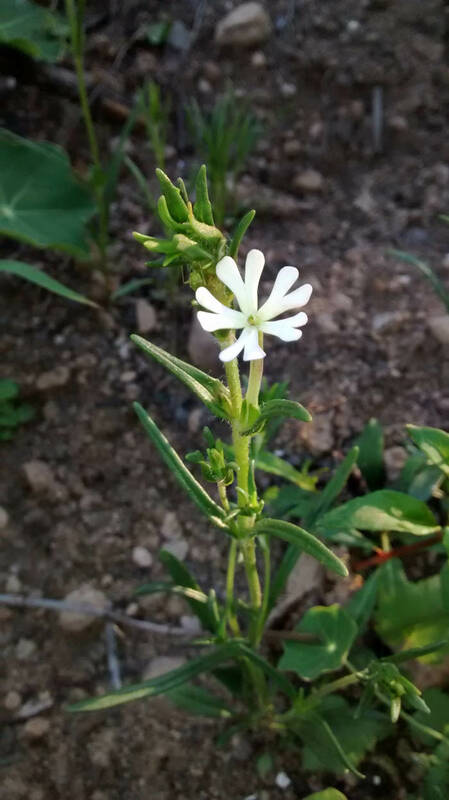 It’s the prettiest of the bunch, a perfect flower. I thought sunflowers followed the sun. Mine don’t. 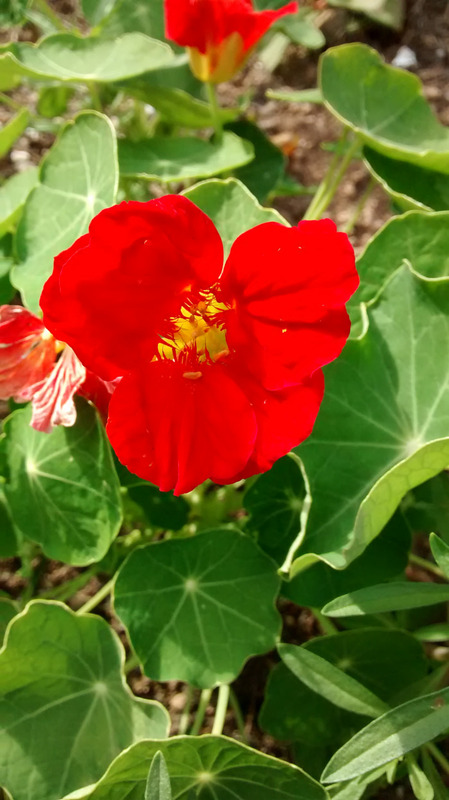 Nasturtium were planted on an impulse. I got the seeds from a local hardware store. They were planted late and didn’t do well. A carpet of these bright flowers must be impressive. And the leaves taste surprisingly good! I’m a little bit less sad about being allergic to arugula. I also got these with the nasturtium. Night Phlox they’re called. I bought them because they remind me of my mother. 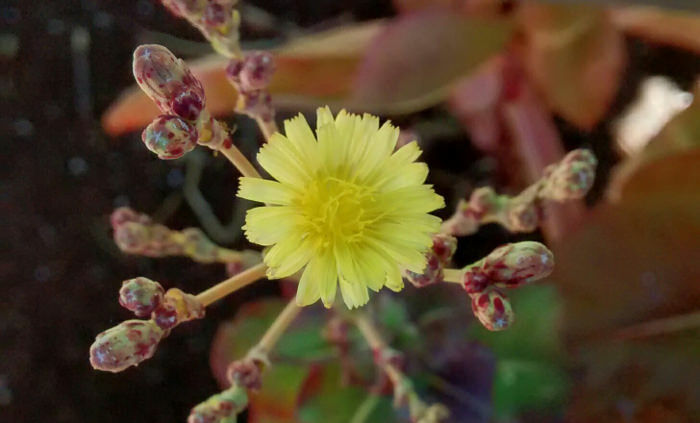 These strange plants open their flowers late in the day, when the sun is down in the trees. And the smell… pure pleasure! They smell like cotton candy. They are still cute during the day even when closed. I wonder if they have a use in permaculture. I’m probably going to grow them again for their smell. The gardens need more smells, I’ll see to that next year. 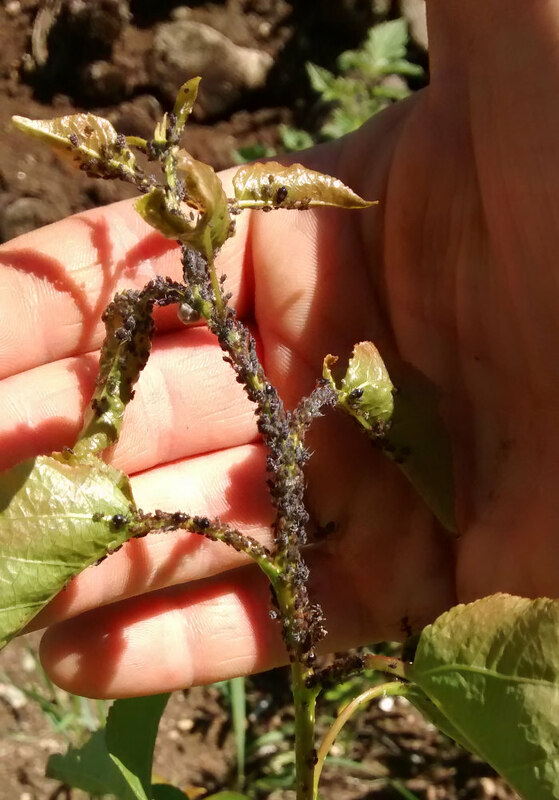 Ants are running around on them bugs, maybe they are aphids. But then again ants are everywhere so it’s hard to tell. 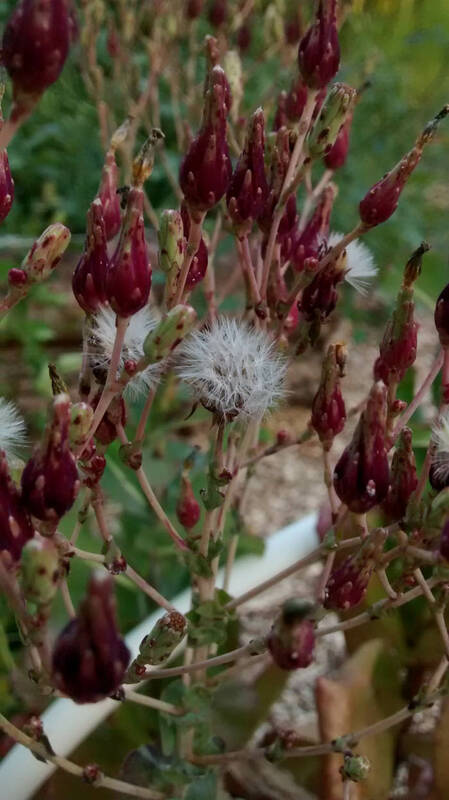 Anyway these little bugs don’t bother my plants, most of them are on baby aspens.